Rs 15000 for 3 days, including manual, snacks, tea/coffee, lunch and also the use of bowls and technology (biowell, HRV devices) during or after the training. Gunjan Trivedi (Life Coach, Sound Healer) has 20 years of global experience (lived in Japan, Singapore, China and the US. At present, he is based in India) and plays various sound instruments (Indian Classical Drums – Tabla, Singing Bowls, Tuning Forks etc). 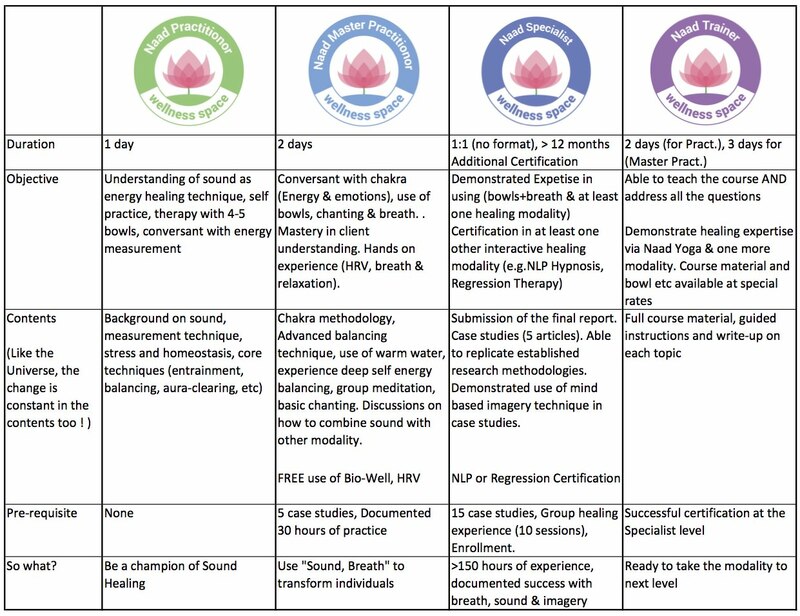 In Naad Yoga 1, you learn about sound, its healing properties and understand why do we use sound healing. This hands-on workshop teaches you about Himalayan Singing Bowl, its healing benefits, how to use these bowls and what is involved in the selection of these bowls. You also learn various techniques to use these bowls for healing, starting with relaxation (using brain wave entrainment), meditation and for healing few specific ailments (e.g.). You also learn about how to measure the energy parameters (before and after the therapy) and experience deep relaxation & homeostasis. In this workshop, you use up to 4 bowls and learn how to use them in various positions based on the client needs. At Wellness Space, we focus disproportionately on making sure you understand the needs of your client first, find out any energy imbalances (you will learn how to do that) and also validate how the healing work has impacted the client’s overall state and the energy. As the curriculum progresses, you also learn to use (your own voice) and learn to explore the use of music for healing purposes.